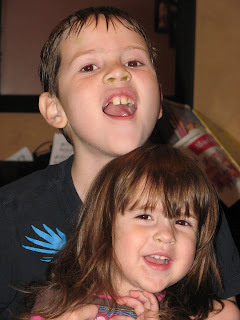 mommy daily vent: The Boy is 7! Wow! Time does fly! My children are growing up in the blink of an eye! How wrong I was. This little guy had a different attitude from the beginning. (Not wrong, just different than I was used to.) He was loud (and still is). Things that seemed very unfunny to me sent him into hysterical laughter (yes, bodily functions included.) His need for rough-housing and super-hero antics also baffled me. What a wonderful dimension he added to our family! Yes, he is loud and boisterous at times, but that means he is enthusiastic about life. His laughter and jokes help lighten the mood and bring joy to the house. His mechanical abilities (translated : his ability to take everything apart to see how it works) make for great springboards to discussion. Even his super-hero antics make me proud. Proud that he wants to be the knight in shining armor someday for the girl of his dreams. (okay maybe not the girl part yet, he still thinks they have cooties). He reminds me of his Dad in so many ways. He is slow to anger, gentle and kind. He likes to tease his sisters and mom, but also fiercely protective if anyone else hurts them! He is a great big brother, too! We know God has great plans for you and your life! Awwww, sorry I missed this post! Happy birthday, Noah! Moms of boys are granted sainthood from me!